Megalania is not a dinosaur. It is an extinct giant goanna (or monitor lizard) that once roamed southern Australia. Megalania possibly shares a sister-taxon relationship with the modern Komodo Dragon, though its closest living relative is the Lace Monitor. Like these relatives, it's likely Megalania was a venomous animal, and if that's the case it's the largest venomous vertebrate to ever live. 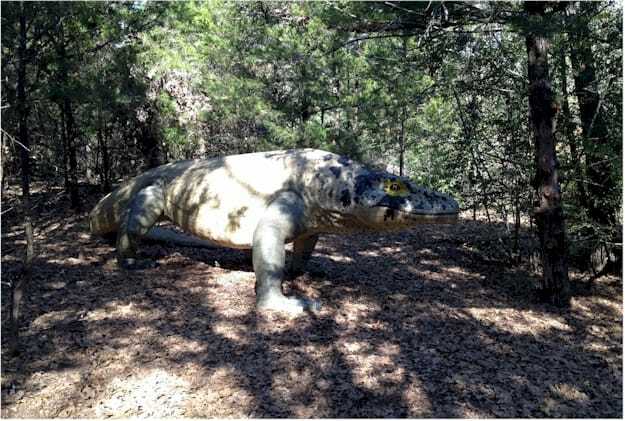 The largest terrestrial lizard to ever walk the planet, Megalania would have likely assumed the apex predator among the megafauna it shared its home with. Its body and limbs were heavily built, and it had a large skull with a jaw full of serrated blade-like teeth. Judging from its size, it would have fed on medium to large prey such as the giant marsupials, along with other reptiles and small mammals, as well as birds, their eggs and chicks. Although Megalania seems to have disappeared sometime after 50,000 years ago, there are actually still reports of these animals to this day. Though these reports started after the animal was first described and there is no true scientific evidence to any of these claims. It is probable, however, that the first aboriginal settlers of Australia might have encountered them.